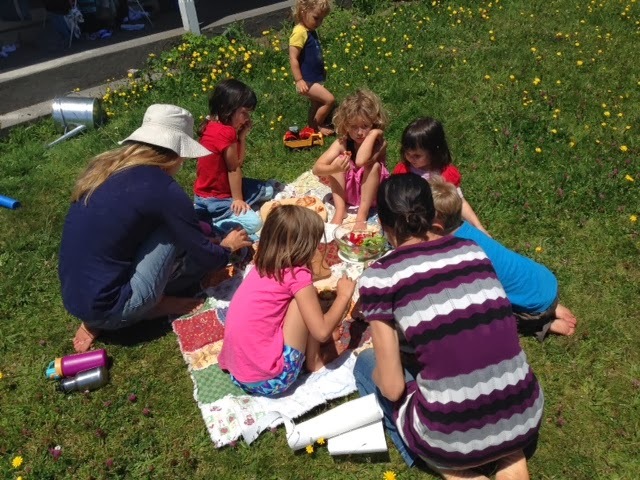 We as home learners who are Self Designing at the base of Mount Taranaki in New Zealand, decided we would consciously come together to collaborate with the learning experiences for/with our children. The ages range from 2-7 years and we have 9 children involved. It will be on a Wednesday and Friday of each week 9:30 until 2pm-ish in the home of one of the families which is a large open space with large yard containing a trampoline, sand pit, vege garden and paddock next door with cows and chickens. There is even a view of the sea from the yard so a beautiful location for us to start. Fishing, Creating Yummy Food together, Kite making and flying, Solar System understanding, Writing stories, Trains, Creating trampoline games together, Collecting chicken eggs (chickens lay freely so it is a little like a treasure hunt), Lego, Shops. The possibilities when allowing a child-led approach is truly inspiring to be a part of. For lunch we all help to make a shared feast and have a space to sit together for eating.